John Deere Mower Belts. Deck, Primary - Replacement belts. We offer a limited selection online at this time. Please call (317) 519-9020 if you don't see what you need. Please have your old mower belt number (or measurements) ready when you call. We'll be happy to help! A36KC Belt. UltraPower® AG V-Belt (Kevlar Covered). 1/2" Wide, 38" Length OC (965mm). A36KC Belt. UltraPower® AG V-Belt (Kevlar Covered). 1/2" Wide, 38" Length OC (965mm). Replaces Standard, Raw edge A36, 4L380 FHP V-Belts. REPLACES: John Deere M110797. 4L380 FHP V-Belt - Consumer Brand. This Stens 265-638 belt replaces JOHN DEERE M126536. OEM Replacement Belt. Fits 38 and 42 C decks on LT133, LT150 Deck Belt, LT155, LT160, LT166 and LT180. Application: Deck (covered). Width=1/2", Length=114 1/4". Replaces Oregon 75-299 belt. A41KC Belt. UltraPower® AG V-Belt (Kevlar Covered). A41KC Belt. UltraPower® AG V-Belt (Kevlar Covered). 1/2" Wide, 42.9" Length OC (1090mm). Replaces Standard, Raw edge A41, 4L430 FHP V-Belts. Replaces John Deere PT8669 HD Belt and M86060. A41 Industrial V-Belt. Superior A41 replacement V-Belt. 1/2” Wide, 43” Length. AX41 POWER ACE V-Belts: AX Series. Cogged 1/2" Wide x 43" Length. JOHN DEERE M47765 OEM Replacement Belt will replace OEM belts that fit models LX255, LX277, LX279 and LX288 with 38" decks. 4L660K, Aftermarket JOHN DEERE M82462 (Deck)/Stens 265-640 Replacement Belt. 4L660K Kevlar FHP V-Belt. Consumer Brand. A64KC Belt. UltraPower AG® V-Belt (Covered). A64KC Belt. UltraPower AG® V-Belt. 1/2" Wide, 66" Length (1676mm). Replaces Standard, Raw edge A64, 4L660 V Belts, John Deere M82462. A64 Belt. PowerAce® Classic V-Belt. 1/2" Wide, 66" Length (1676mm). Replaces 4L660 V Belt. Stens 265-642. JOHN DEERE TCU13196 OEM Replacement Belt. Application: Deck (Covered). Width=5/8", Length=131-1/2". This Stens Brand replacement belt fits John Deere models 737 and 757 with 54" decks. Made to exceed OEM requirements and longevity. 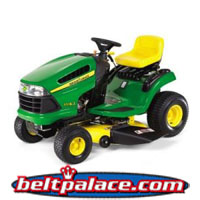 This OEM Spec belt replaces JOHN DEERE TCU21054. This OEM Replacement Belt Fits 1445, 1545 and 1565 (Serial No. 060000 and higher) with 60" decks. JOHN DEERE M151277 Replacement Drive Belt. Fits JOHN DEERE X300, X304, X320, X324 and X360. STENS AFTERMARKET 265312. Model years 2007-2009. Serial numbers M0X300D040001 & After. MT3429 OEM John Deere Round Belt. Aerator Head Drive MT3429 for Aercore 800 Greens Aerator. M122107 John Deere Blade Drive Timing Belt. Aftermarket brand Secondary synchronous drive belt replaces John Deere M122107.